punditman says at 12:00 midnight EDT: Could it be that Germany is backing off sanctions under US pressure, in order to give the neo-cons the excuse they want (ie: we tried sanctions, but that doesn’t work). Regardless–Fox of course thinks this is a great idea. WASHINGTON — A recent decision by German officials to withhold support for any new sanctions against Iran has pushed a broad spectrum of officials in Washington to develop potential scenarios for a military attack on the Islamic regime, FOX News confirmed Tuesday. Germany — a pivotal player among three European nations to rein in Iran’s nuclear program over the last two-and-a-half years through a mixture of diplomacy and sanctions supported by the United States — notified its allies last week that the government of Chancellor Angela Merkel refuses to support the imposition of any further sanctions against Iran that could be imposed by the U.N. Security Council. WASHINGTON — They sat behind burgundy-covered witness tables for more than 16 hours of testimony and answered hundreds of questions about the Iraq war, some of them pointed, some of them softballs. But there was one question that Army Gen. David Petraeus, the top U.S. military commander in Iraq, and Ryan Crocker, the U.S. ambassador in Baghdad, couldn’t, or wouldn’t, answer. Much to the frustration of the senators — mostly Democrats, but including a few Republicans — who grilled them Tuesday, neither the general nor the diplomat outlined a strategy for putting Iraq back together or a timetable for bringing U.S. troops home. Four and a half years after the U.S.-led invasion of Iraq — and four years after some Pentagon officials thought American troops would be home in triumph — two days of breathlessly anticipated testimony by Petraeus and Crocker appear to have produced another stalemate in Washington. Last month seven US soldiers in Iraq criticised the war in NYT. I had posted their article on Suzie-Q blog on August 20 under the title ‘American Soldiers Speak About the War In Iraq’. I feel deeply sad that two of these soldiers have died in CheneyBush’s criminal war. NY Times, September 20, 2007. They were referring to the ordeals of Iraqi citizens, trying to go about their lives with death and suffering all around them. They did not know it at the time, but they might almost have been referring to themselves. Two of the soldiers who wrote of their pessimism about the war, in an Op-Ed article that appeared in The New York Times on Aug. 19, were killed in Baghdad on Monday. They were not killed in combat, nor on a daring mission. They died when the five-ton cargo truck they were riding in overturned. The victims, Staff Sgt. Yance T. Gray, 26, and Sgt. Omar Mora, 28, were among the authors of “The War as We Saw It,” in which they expressed doubts about reports of progress. 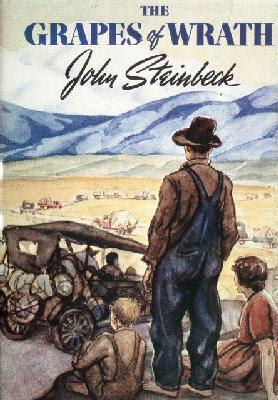 When I was in the sixth grade my mom handed me a copy of The Grapes Of Wrath to read, and I was turned on to real literature from the salt of the earth. This was in 1949 and we lived about 40 miles from the Salinas Valley. In fact, before we moved to Santa Cruz, our whole family spent the summer picking grapes in the San Juaquine Valley while my dad was between jobs as a Chevrolet automobile mechanic. Needless to mention I loved the writing of Steinbeck and went on to read Of Mice And Men along with many other of his books. Mom was an avid reader and always had boxes of paperbacks. If anyone had told me that Steinbecks literature would be banned from public libraries I wouldn’t have believed it. Anyway, George W. Bush, who is planning his own Presidential Library, has cut funding to many of our public libraries. In particular, the library in Salinas where it is said that he got some of his early exposure to the power of literature. In the depths of the Great Depression, not a single public library in America closed its doors. Banks went under, farmers went bankrupt, millions of people were out of work and out of luck—but the American public clung to its libraries, not only because of their inherent value to our society, but also because they are symbols of community strength and hope. How lame, then, to see public officials today—from George W. Bush to city council members—reaching for the budget axe to whack library funding, forcing branches to close, valuable services to be eliminated, and hours to be cut. In a time of unprecedented wealth in America, in a time when governments dump billions of taxpayer dollars into corporate subsidies and boondoggles, our so-called leaders are failing the people by going after these true public treasures. Check out Salinas, Calif.—a hard hit working-class city which is now the largest population in America without a public library. Ironically, this is the hometown of John Steinbeck, the prize-winning author of The Grapes of Wrath and other powerful works that chronicled the human spirit during the Depression years. Steinbeck knew that literature has the power to elevate the spirit and help people rise above difficult times, and it is said that he got some of his early exposure to the power of literature at the Salinas library. Since Steinbeck’s day, Salinas expanded to three branch libraries, one named after him. But now, all three have been closed by the city council, which is facing large budget deficits. This move shuts out the 1,900 people a day who count on the library for books, literacy courses, internet access, after-school programs and other services. Also, nearly three dozen employees have been shown the door. According to the Records of the Grand Historian, after Qin Shi Huang, the first emperor of China, unified China in 221 BC, his chancellor Li Si suggested suppressing the freedom of speech, unifying all thoughts and political opinions. This was justified by accusations that the intelligentsia sang false praise and raised dissent through libel. Beginning in 213 BC, all classic works of the Hundred Schools of Thought — except those from Li Si’s own school of philosophy known as legalism — were subject to burning. Li Si proposed that all histories in the imperial archives except those written by the Qin historians be burned; that the Classic of Poetry, the Classic of History, and works by scholars of different schools be handed in to the local authorities for burning; that anyone discussing these two particular books be executed; that those using ancient examples to satirize contemporary politics be put to death, along with their families; that authorities who failed to report cases that came to their attention were equally guilty; and that those who had not burned the listed books within 30 days of the decree were to be banished to the north as convicts working on building the Great Wall. 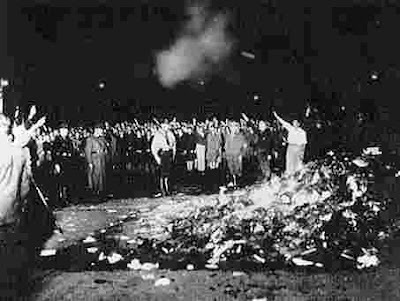 The only books to be spared in the destruction were books on medicine, agriculture and divination. 09/11/07 “ICH” — — On Sept. 7, National Public Radio reported that Muslims in the Middle East were beginning to believe that the 9-11 attacks on the WTC and Pentagon were false flag operations committed by some part of the U.S. and/ or Israeli government. It was beyond the imagination of the NPR reporter and producer that there could be any substance to these beliefs, which were attributed to the influence of books by U.S. and European authors sold in bookstores in Egypt. NPR’s concern was that books by Western authors questioning the origin of the 9-11 attack have the undesirable result of removing guilt from Muslims’ shoulders. NPR’s assumption that the official 9-11 story is the final word is uninformed. Polls show that 36 percent of Americans and more than 50 percent of New Yorkers lack confidence in the 9-11 commission report. Many 9-11 families who lost relatives in the attacks are unsatisfied with the official story. Why do the media brand skeptics of the official line “conspiracy theorists” and “kooks”?